Here are some of my favorite Easter crafts for your holiday party from fellow bloggers. My World Made by Hand made these adorable Chicks and Bunnies. I think these guys are so cute. I hope I can find the time to make a few for my Easter dessert table. I plan to dress it up with lots of different types of cute Easter animals, and these would go right along. She did such a great job with sharing the directions that even I can follow along and make these easy spring chicks and bunnies. Circus Berry shared how her daughter made this Easter Hand Print painting. This is such a cute idea. The little hand prints look so cute as grass and what little girl wouldn't love to use glitter sticker eggs? 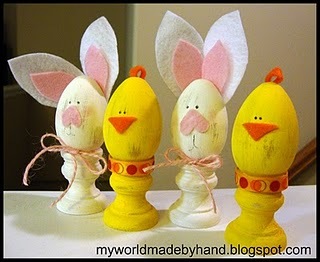 What a great craft for an Easter party or an activity for kids to enjoy while parent's are chatting away after dinner? So much fun. 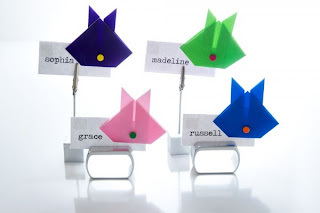 Edit by Design shared how to make Origami Rabbits to use as placecards for your Easer table. I've never made anything using origami, but these look pretty easy and wouldn't it just wow your guests? So original and fun. You could even have your kids help you make them as a pre-Easter crafting party. 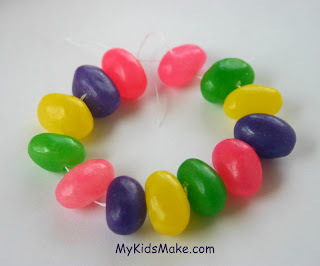 My Kids Make shared how to make these cute Jelly Bean Bracelets. What a fun idea! I have a jelly bean idea that I am going to try next week (hopefully) and will have TONS of jelly beans on hand for it. I think I may sneak a couple of these in there too. What a fun craft idea for your Easter party or what about using these for a glass decoration? There are so many fun ways you can use this idea. Thanks for the shout-out on my origami rabbits, Kim. Happy Easter!